You might not recognize the name Jean Dee, but you still might have heard her voice. She was born Yvonne McGowan on Christmas Day in Oklahoma and has recorded and performed under a variety of many different names and genres. Some of the different names she has used include Yvonne O'Day, Vonnie Taylor, Vonnie Mack, Jean Dee and Yvonne DeVaney, which she still uses today. At the age of two, she began singing and yodelling, and by 11 she won a contest playing classical piano. She also played guitar and bass. While still in high school, she teamed up with her sister Mary, with Yvonne playing guitar and Mary on accordion, and had a duet song and tap dancing act. They performed with Roy Rogers and Trigger once! Some of the labels she's worked with include Capitol Records, Columbia Records, Decca Records, Phillips Records, Spar Records, King Records, Chart Records, Compo Records and for her own YMD Music Group, which she founded. If that sounds like she really gets around, she does! But, by recording for all those different labels, she got to perform with a variety of artists. Some of those include Merle Lindsay's Western Swing Band, Red Foley, Pee Wee King, Minnie Pearl, Bob Wills and the Texas Playboys, Tommy Duncan, The Anita Kerr Singers and a former featured artist here on Music For Every Mood, The Jordanaires, who back her on today's song. If you listen closely, you can tell it's their trademark sound! Her biggest claim to fame would probably be her songwriting talents. She's written songs that have been recorded by Dean Martin, Vic Dana, Pat Boone, Billy Walker, Dottie West, Wanda Jackson, Bonnie Guitar, Hank Snow, The Hardin Trio, Carl and Pearl Butler, The Wilburn Brothers and The Cheltenham Singers, out of England. Some of the many songs she's recorded herself, under different names, include Snowflakes, I Just Want To Be With You, Love Is A Gamble, Does It Hurt You To Remember, I Live For You, Please Forgive Me, Blue Mountain Waltz, Slowly I'm Losing You, Open Arms, If You Don't Somebody Else Will, Sweethearts On Parade, My Greatest Hurt, Open Arms, Step Into My World, Dim The Car Lights, Pick Me Up On Your Way Down, Teach Me To Live Without You and Tell Me A Lie, among countless others. She's enjoyed a very full recording career! She has received a BMI Citation of Achievement Award for her writing and holds the honorary Comission Rank of Commodore in the Oklahoma Navy. Some of her latest releases include The Yvonne DeVaney Collection of 2003. Today's song, Day By Day Your Love Grows Sweeter, is a song that was recorded during her "Pop" period. In it she sounds like a cross between Patti Page and Patsy Cline, not a bad thing at all! The arrangement fits the mid- to late-1950's era, so that's when I would place the recording. It's a pleasant uptempo song about a love which grows stronger day by day. She has such a strong and confident voice while delivering the lyrics of which she herself wrote, that the song's theme becomes something very believable and likable. She interprets it perfectly! But, don't let me influence you on this delightful song, download it for your yourself and see if Jean Dee doesn't have an irresistably catchy voice while singing her own song Day By Day Your Love Grows Sweeter! She's such a treat to hear, it's too bad she didn't stick with the Jean Dee name and sing more songs like this! 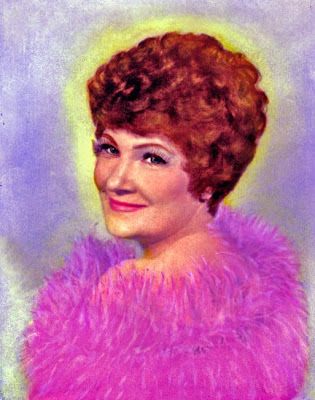 I could Have sworn this was Kay Starr! Makes me think some of the greatest singers were not so unique after all but got a better chance (recording studios, management...) than others. I believe you're right on that actually being Kay Starr. I got that phrase from when Jean Dee and her sister started performing and they were known as "The Oklahoma Sweethearts." This would have been when Jean was still in high school, so I'm not sure of the actual year. Maybe Kay Starr heard of them and liked the phrase, or maybe they liked her and took that moniker in honor of Kay Starr. I haven't been able to locate which might be true. Thanks for the welcome back! There's Gonna Be A Catfight!